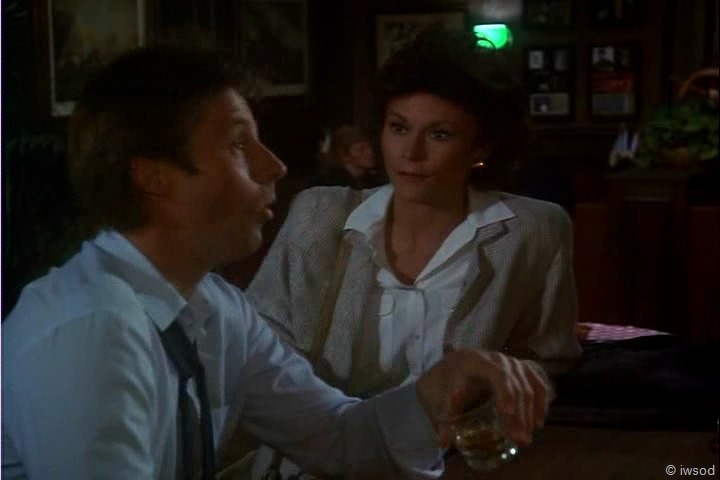 3/15 Season Two, Episode 21: Burn Out-Scarecrow and Mrs King | "Just walk with me.."
Amanda walks into Nedlindger’s.. ready to listen to Lee’s problems.. doh!! 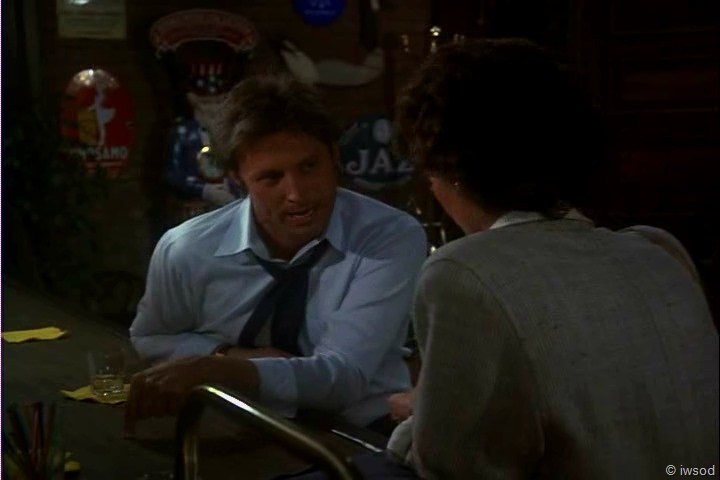 She interrupts Lee getting to know his new buddy Jack Harris. Amanda: (to Lee) Hi. I went to the office to talk to you. Mr Melrose is looking for you. .. Amanda, what are you doing here? Amanda: I came to get you. Mr Melrose is really pretty upset. Lee: I could really care less if Mr Melrose is upset or not. Amanda: Lee, listen. Are you in some sort of trouble or something? Lee: What, me? No, no, I’m feeling on top of the world. Lee : Yeah, yeah, second volume of Ballarde’s manual on stress-related problems, right? LOL- I’d say Lee knows it because he read the textbook so he can do this cover really well! Lee looks over to Jack Harris’ table and sees that he has left. 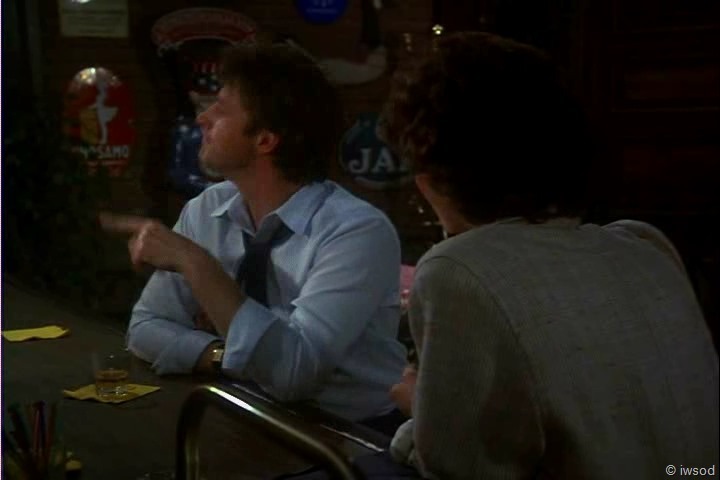 Three glasses- who was Harris sitting at the table with? 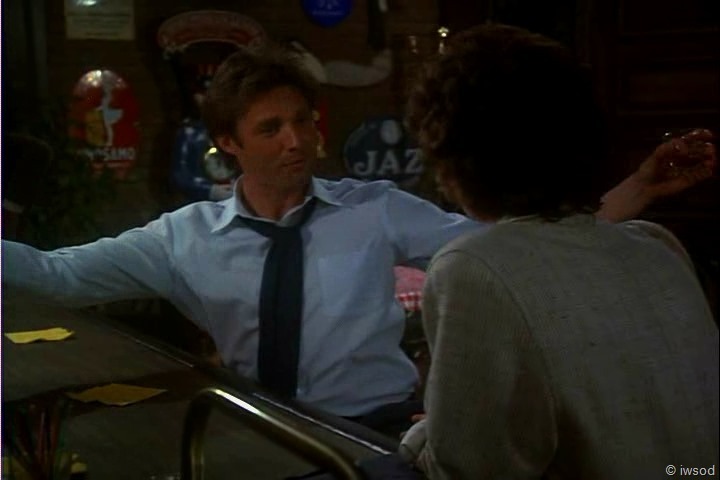 Wow.. so this little performance is for Ned and Amanda huh.. lovely.. grrr..
Lee: Yeah, uh, Ned, c’mon. Hit me again, will ya? And, oh, and, um, give the lady a Shirley Temple. Amanda: I think you’ve had enough. … I’ve had enough of that before you even start, believe me. Amanda: Lee, I just came to talk. Lee is being so awful to Amanda here..but she stays calm, trying to do what is best for Lee. Lee: Ohhh, please, all right, all right. All right, let’s go and get it over with. Amanda: OK. Oh, wait a minute. Look, here. You can’t go like this. You look terrible. Lee: What do you mean I can’t…. 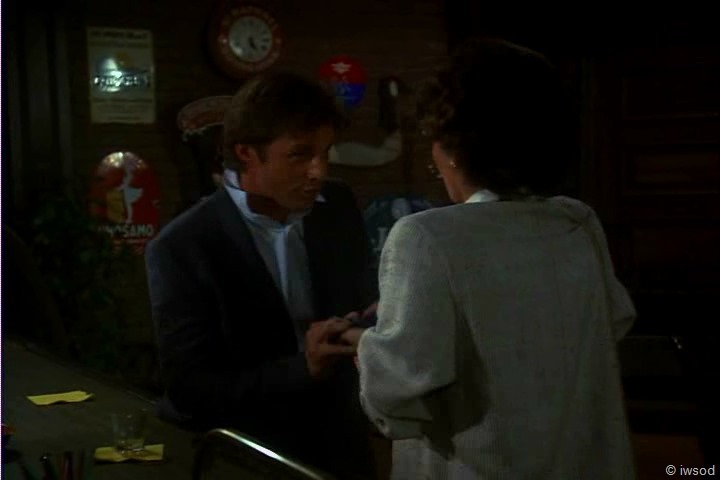 Amanda picks up Lee’s jacket and helps him with his sleeves. Amanda: Just roll your sleeve down. Hold your sleeve. Hold your sleeve. Lee: All right, all right, all right. Amanda: Put your jacket on. If you’re going to go, go looking good. Lee goes along with visiting Billy again..
Lee: ha! go looking good..
Amanda: Put your jacket on. There you go. Lee: That’s a pocket…. Amanda!!! 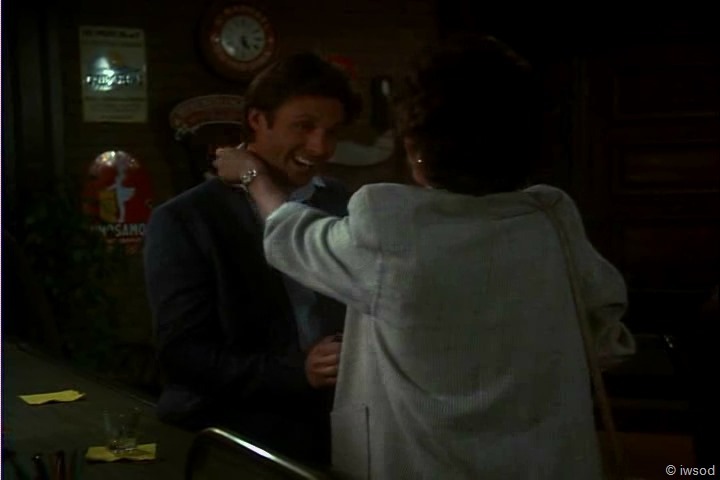 Amanda: I’ve got to fix your tie. This is really bad. I hope you like a Windsor knot. [This pic is begging for a meme- anyone?? don’t you just take this and you practice with it and you enjoy it, OK? Lee: I don’t care. I don’t care what Billy thinks, all right? Lee walks to the door. Amanda hurries after him, and shuts the door behind them. Amanda and Lee are kinda cute with her helping him with his jacket and tie. I love this episode, but I find Lee’s treatment of Amanda here as part of his cover, hard to watch. How about you? 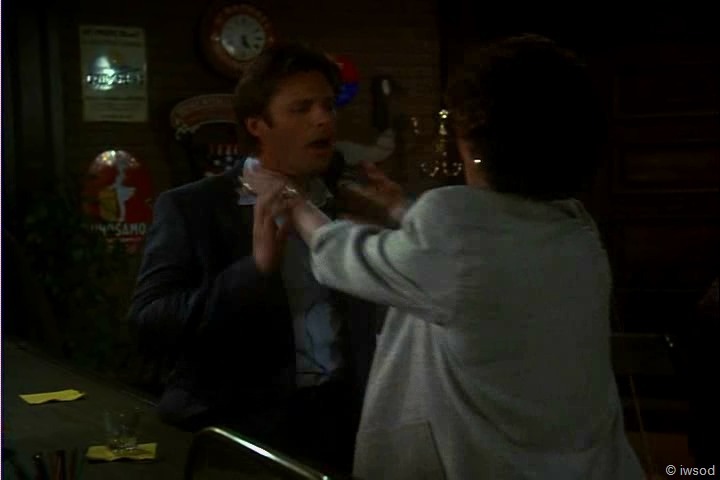 I want to think that Lee’s character struggles to behave this way with Amanda- because he cares about her – but knowing the scene with Billy is coming up next– I don’t know that he is struggling with not being able to share this cover with Amanda, and having to treat her poorly- not so far… Do you think he is? guess I am jumping ahead a tad on this sorry. I’m not going to get to Billy’s scene in this post..next one! This cover is hard on Amanda and it’s so unnecessary to hurt her like this.. His nastiness and complaining of her ‘playing little miss social worker’ is pretty low – when she has, in the past, shown herself to be a good friend to him. Also about episode order- I’m thinking maybe it works better if YODTwice and their closeness there comes after this episode.. Hmmm I’m wondering.. what do you think? Well, we can continue to explore this as we walk through the episode – but as always, I’m looking forward to hearing what you think.. Okay – byeee for now!! Love how Lee says, “Mr. Melrose”. Did a quick Google search, Ballarde has no stress manual! Anyone else find one out there? You know, even though Lee sees that Jack is not at his table, I’m not troubled that Lee continues his performance. I think he is really trying to convince everyone at Ned’s and Amanda that he is a burn out. If he just turns it off here and someone else sees, then it could get back to Jack. This is Lee’s life we’re talking about here – three other agents are already dead (or is it two?) and so Lee really has to be convincing. I’m wondering if Ned doesn’t know that Lee might be an agent. He’s a bartender in DC, most likely physically close to the Agency, he’s got to hear things and be at least suspicious. I do not find this scene hard to watch. One of the things I most like about Lee is how he is so attentive and focused and dedicated to the job at hand. To me that is a great quality for a person to have. And nobody does it better than Lee. He is single-minded in his pursuits – for work or for women. It’s as if when he’s working on a job or seriously pursuing a woman, there is nothing else or no one else that matters. He is willing to do what he has to do to nail the bad guy or love the woman he’s with. At this point he is friends with Amanda and cares about her, but she is not in on the secret, so he has to be like this with her. This is a high stakes assignment he’s on and he really has to appear like a real burn out so the bad guys will approach him. This is more important to him right now than his relationship with Amanda. I think he believes that after it’s all over, Amanda will understand, or hopes she will. And if she doesn’t, well, he thinks he’s not that emotionally invested in his relationship with her for it to get in the way right now and he’ll cross that bridge when he gets to it. I do not think that Lee sees Amanda as an equal or anywhere near an equal at the Agency. Her ‘partner’ status to me is still on a case by case basis. She is not always his partner, otherwise, she’d be part of the act here. Amanda is still ‘just a housewife’ despite all the ways she’s come through for him in the past. I still think that Lee thinks she is mostly lucky and a good guesser. She’s gaining some of his respect (i.e. LOTP), but she is not there yet – Amanda the agent is still developing – and this episode gives Lee a walloping dose of just how far she has come – but we’ll get there in a bunch more posts – for me this is one of the most important episodes of the series for Amanda’s character professionally. You tease, iwsod!!! 🙂 Actually the end of this post is what I’d call a ‘soft tease’. The hardest tease ever was the blog side pic two pics ago…yeah, you know the one…the one that I couldn’t look at without going to watch…!! Glad you know it’s all in fun for me!!! Oh lol! come on .. I did eventually post a gif of the kiss – where they did Kiss!! so you were rewarded in the end haaa.. err I did didn’t I? LOL! Now I’m wondering.. am I remembering wrong? haaa.. I actually really enjoy this particular scene. I too always felt Lee’s treatment of Amanda was strictly to turn her off of helping him and to drive her forcefully away. It was for her own good, and of course she definitely does not have a need to know. Interestingly enough, I was just telling my daughter about the different points of view here on Lee’s treatment of Amanda, and she said she agreed with Iwsod rather than me. (What!?!?) Then she had the nerve to say my tolerance of Lee’s treatment of Amanda was probably an age thing, something more accepted by my generation — hah! Unfortunately she may have a point there, but it may not be a man-respecting-woman thing as much as a people-respecting-people thing. Did anyone see the Baby Blues comic strip in the paper last weekend? The dad was describing to his young son how Lucy Van Pelt would pull the football away from Charlie Brown and how he, the dad, would laugh every time. The poor kid got alarmed and told the mom (or maybe it was his sister, I don’t remember) that dad approved of bullying. Now I never thought the football gag was terribly funny — it did seem sort of mean — but back in my age the “blame” went to CB for being so gullible whereas today the blame goes to Lucy for being a bully. There is definitely a different level of tolerance today. Did that ramble make any sense? I think the putting-on-the-coat scene is adorable. BB and KJ are spot on with each other and the whole thing flows so naturally. I always wonder if the “that’s the pocket” line was scripted or ad libbed. I suppose it was scripted, but it’s so well done that it seems natural and spontaneous. And I love the discussion here about the intimacy of Amanda tying Lee’s tie. There is also a very strong mothering aspect here, just like he accused her of, and I’m sure this makes him feel off balance. He acquiesces like a little boy. This makes me think of the tag of SAAB where the TV is in the background blaring about “meeting the mother you’ve never known” while Amanda steps out to greet Lee on the back porch. I think Lee is both threatened by and drawn to Amanda’s mothering tendencies, not at all surprising considering his past. And yeah, Lee looks mighty fine here, for sure! I remember watching this episode way back when and I never thought the way Lee treated Amanda was all just a part of the cover(sorry). 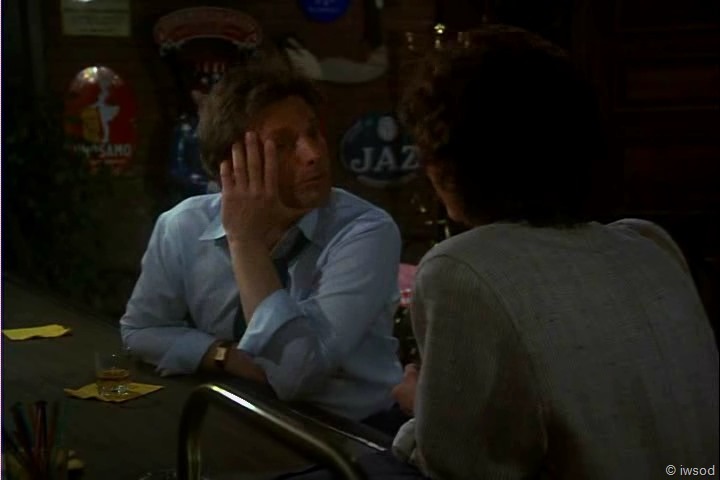 I think he would have used more self restraint if he wasn’t into the role and hadn’t been drinking, but I think he was genuinely very frustrated with her. It was the loner in him coming out again. He use to be able to do his job without anyone looking over his shoulder or having to answer to anyone. Quite frankly he is just not use to anyone caring, even good old Francine who has always acted so territorial of him(to Amanda at least) isn’t willing to stick her neck out for him and seems pretty quick to give up on him. While having someone who really does care is overall a good thing for Lee and something I think he has come to appreciate for the most part at this point, it does sometimes make it harder to do his job. In fact later on the fact that Amanda cares about Lee is almost like a tool he is willing to use to further the believibility of his burn out. That’s the way it seems to me in the scene with him and Billy mentioned in the post. It’s like Lee is going to have to deal with Amanda caring so he might as well use it to his advantage. That idea always left me cold and shows the true gravity of just what kind of world he lives in. It’s not really until later in the episode where you see Lee’s hand forced a little in having to go so far to push Amanda away that the gravity of what he is doing really sinks in for him, and then I think he is really truly ashamed of everything he has done to her. Still shows progress on his part to me because I don’t think a year ago he would have felt as ashamed as he comes to now, and I don’t think even six months down the road from now that he would’ve been able to handle treating Amanda the way he does in the above post. Just MHO though. Wow, I miss a few hours on JWWM and everyone manages to read my mind and tell me what I think but am too inept to put into words. Bravo people! I was watching The Hobbit again today coz the second part is coming out on Friday (Yeah!). There’s a line in which Bilbo asks, “Can you promise that I will come back?” and Gandalf answers, “No. And if you do… you will not be the same” just struck me as apropos to this episode. I know, bizarre connection but it rang quite true. After this, neither Lee nor Amanda will be the same. Lee tries to keep Amanda away from himself and in the dark but ends up drawn to her radiance and light. Their “unexpected journey” is well underway! “Lee tries to keep Amanda away from himself and in the dark but ends up drawn to her radiance and light. Their “unexpected journey” is well underway!” Bravo to you Jule! I love that!! Lee does go to a very dark place indeed! very well put..
That is an amazing way of looking at it. I’ve seen this episode more than once and I never got that before. bravo. A Tolkien quote is the best to describe any situation, Jule! This one is perfect. Lee and Amanda will never be the same. And to quote Frodo from the Return of the King, they will never be able to go back to the way they were either. I’m looking for a miracle in my life. Oh, I am so far down these rabbit holes! I must find some hot chocolate and marshmallows to soothe me while I watch Burn Out again. Meet y’all there! His behaviour didn’t bother me because I figured he was trying to keep Amanda away from him and out of the line of fire. Silly Lee — he should have known that would never work. I like all the comments, especially what Valerie and KC had to say. I do think Lee had to get Amanda to back off and I think he knew it wouldn’t be easy. Another reflection back to Savior. In that episode Lee did learn a bit about Amanda and how she viewed friendship, she had told him then that because they were friends she wouldn’t leave him alone if she thought that he was making a bad decision. How would she handle his new turn of events? Just like she is. I wonder how he kept his apparent slide from her for so long? But this does pose a new problem for poor Lee ( I keep thinking of him as “poor Lee” now because he has such a conundrum to deal with and until he does I will have fun feeling sorry for the poor, lucky guy. Really to be loved the way he is by someone like Amanda, poor fellow). Someone commented in the last post that maybe Lee was suffering a sort of burn out here because he was willing to burn every bridge, I think It was debilyn. I don’t know if I am understanding your comment rightly, but it made me think… oh no I am thinking again ;). I mentioned on the first post that I do think Lee would have been in danger of burn out if he had kept on the path he seemed to be on in The First Time. But in the beginning of this episode it seems as if he is pulling from the same position he was in then, reckless and willing to do whatever it takes. Only he isn’t the same man, as much as he may want to be, or maybe he doesn’t want to be the same. I don’t know if the issue has been pushed for him yet. It has in the past few episodes in terms of Amanda’s character, but not his. He has probably wondered what kind of an agent he could be if he did allow himself to care for someone, but other than keeping Amanda safe, he hasn’t had to encounter anything that would bring that new reality in his life to a knife’s edge, has he? Well, poor Lee, he is about to find out. Good thing he has allowed himself to care for Amanda this time and not some liar like Eva, huh? Oh, oh, oh, And I really want to say that I liked your comments about Lee not coping well with Amanda’s very touchy fussing. Someone genuinely caring for him, someone that he is beginning to care about touching him in tender manner, someone feminine fussing over him because she genuinely is concerned for hi well being, Too much to handle. Like I said, Poor Lee! Tee hee hee… like shaking a can of soda. He’s gonna blow! 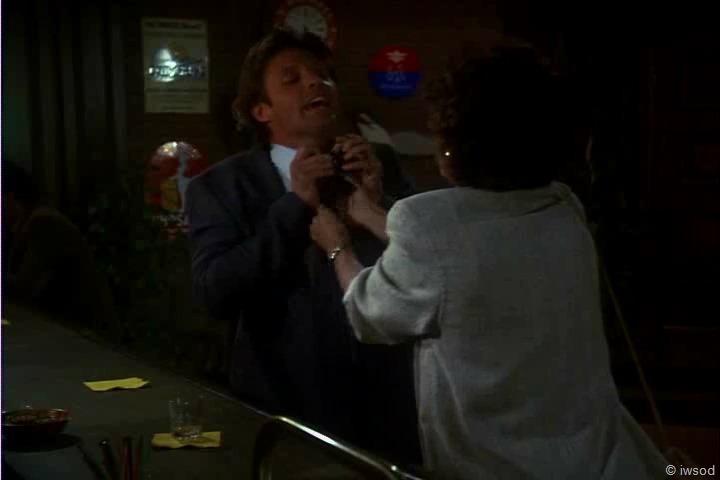 You know, I think there is something in that tie tying bit. It makes me think of Dead Ringer and the way Lee seems jealous in Mongoose when Amanda fixes Commie’s tie. And even her comment here about being a little out of practice… There is just something there, something kind of more intimate personal relationshippy… kind of? Yes. Tying Lee’s tie is something very much more personal and intimate than Lee would be comfortable with… but it’s just who Amanda is. And the out of practice bit adds yet another level to the intimacy because it screams of her having tied Joe’s tie when they were together and aren’t now. True, but I think Lee identifies it a bit with the growing relationship he has with Amanda as well. 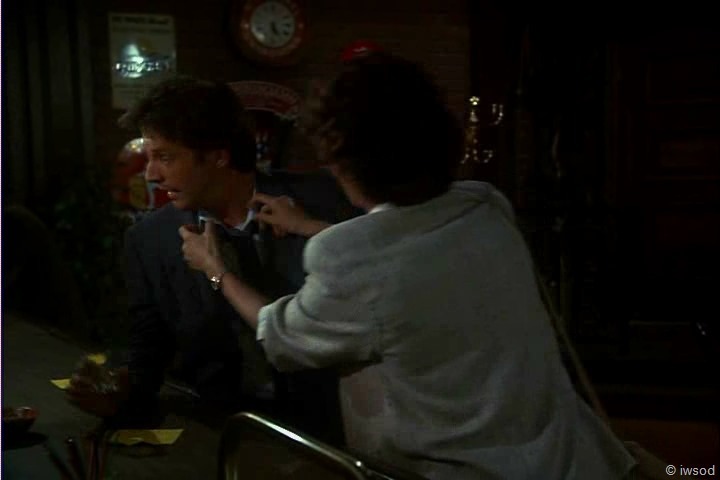 He le her fix his tie in Dead Ringer, it seemed almost natural, and he was jealous that she was fixing Connie’s tie and it almost seemed as if he was thinking, “hey you do that for me, why are you doing it for someone else?” Here it is as if it serves as a reminder of the close personal relationship they now have and how this behavior, or this way of handling a case without including Amanda and causing her this concern, can not go hand in hand. Does that make sense? 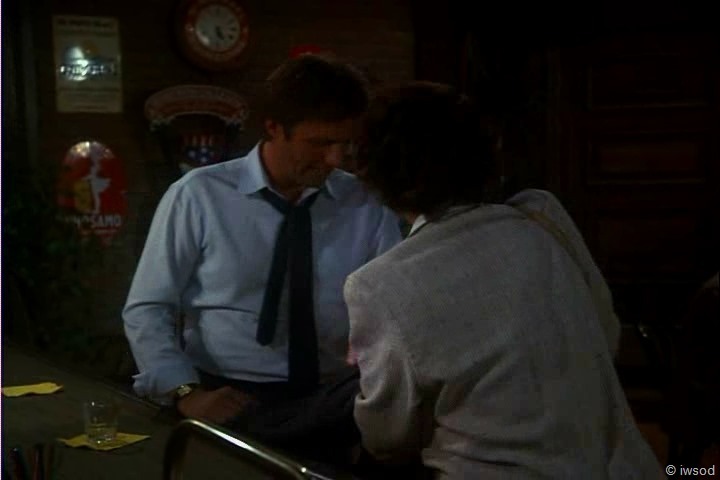 I think his discomfort here is not just that she it tying his tie and that the intimacy of it bothers Lee, I think it has more to do with what he is doing to that intimacy that is signified by the tying of the tie. Good grief, talk about splitting hairs Morley. Could I read a novel into anything? yes, I think I could. But what fun, he he. Yes, it’s the added context of the situation that ups the discomfort. Have fun with the hairs. Fun is fun. And that last photo! Hilarious! If I could make memes I’d definitely have Lee praying over Amanda or casting out an evil spirit. A bit irreverant, but he’s got a classic posture going on there. I think I fell in the silly version of the rabbit hole today. Enjoying everyone’s thoughts on Lee’s motivations in this scene. 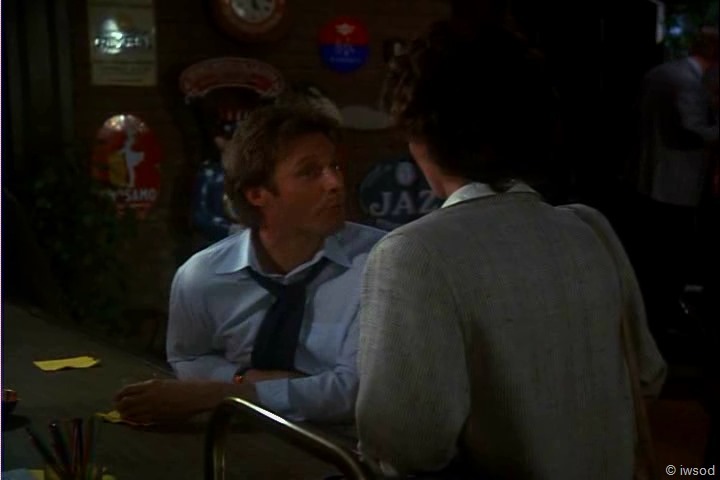 Haaa oh BJo I don’t know…Amanda walks into Nedlindger’s and sees three people: a bartender, a little dutch boy, and a drunk secret agent….Ummm..
maybe : The little dutch boy says to the drunk secret agent: hello, where is the leak? 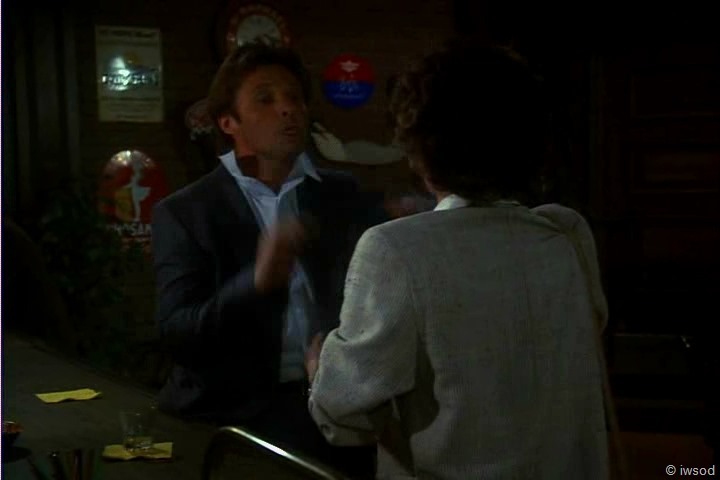 drunk secret agent to dutch boy: there are no moles at Neds! Bartender to dutch boy: leak? What kind of double dutch are you saying here?! Dutch boy: Yes I heard there was a leak at the watering hole..
Bartender: Well, this is sometimes called a watering hole- why? Dutch boy: Well where is the leak? I heard there was a watering hole here so I came to stick my finger in it and save the city! Amanda: This is no place for a little boy! This place is Dutch treat! 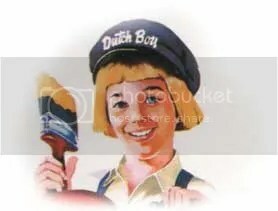 He is a character in an old US advertisement for Dutch Boy paints. Actually his hair is kind of like Jamie’s in early S1 too! I think that Ned would have to be deaf and blind to not know that stuff goes on. 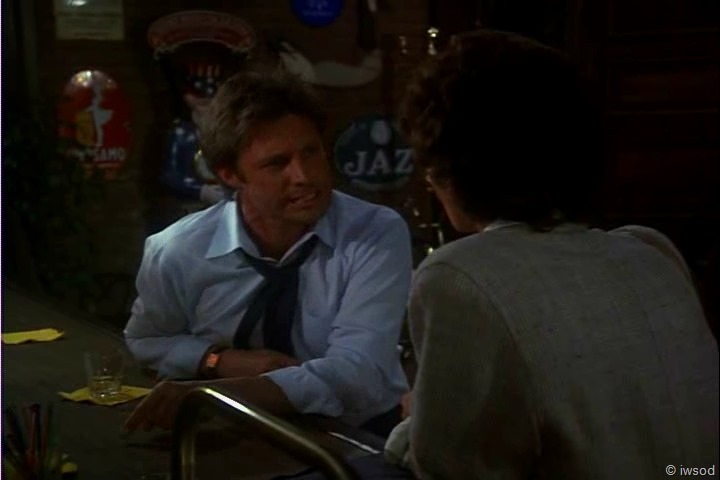 He’s a bartender… sees and hears all. (And, BTW, agent doesn’t have to mean intelligence agent–it could be insurance agent, travel agent [LOL–that one deserves jokes], etc.) Can Ned tell that Lee’s playing a cover and not really drunk? 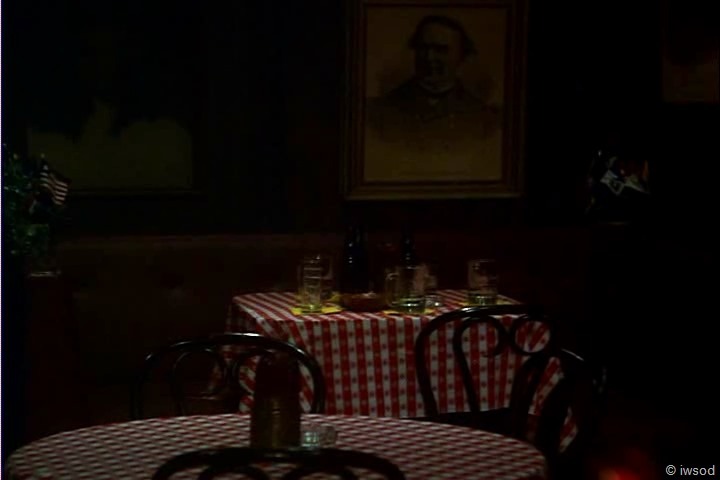 Well, Lee wasn’t in Ned’s drinking all day. He only got there a bit before Amanda, right? –> He got drunk really quickly on presumably few drinks. Ned would see through that. I agree with the others that Lee is overdoing it, ‘cos he knows Amanda, and knows that she’s loyal to a fault and stubborn. She won’t easily give up trying to help him… I think that given how far he’s come in his journey this far, it had to be tough on him acting like this toward Amanda, but I think he views it as protecting her. Looking to the greater good. (Inflicting a bit of hurt to avoid greater hurt.) But, I also think that he might be making 100% sure that his cover isn’t blown if, e.g., there’s a hidden camera at Ned’s, or something similar. Wheeee!!! Amanda messing with Lee’s tie! Me likey!!! Swoon-thud. LOL! I think he knows that the job has to get done, and that he’ll be exonerated later… Being an agent isn’t a walk in the park–they have to do sucky things to get the job done and this is just one of them. I think they all probably live, to a certain extent, in an alternate reality where they don’t believe 100% in anything or anyone or any action (which is why Amanda is so unique because she *is* 100%). I don’t think that anyone in the Bullpen would be at all surprised later to know that it was a cover — does that make sense? I think Lee knows how tenacious Amanda can be. In Savior he told her to back off but did it in a fairly polite way. She didn’t and ended up getting somewhat caught in the crossfire. Maybe he felt he needed to come across a bit stronger not only to keep her away from him, but to keep the bad guys away from Amanda. Of course, we all know how that usually works out. I’m sure that Billy and Lee discussed it before hand as to how far Lee would need to go to make his burn out look as realistic as possible. They to agree that it was okay to pull out all the stops. Billy was okay with Lee grabbing him, which we know that he would never do that to Billy under normal circumstances. When first looking at this episode some of us wondered what was going on too. I think too that it was discussed before how sometimes these agents can get a bit lost in these undercover roles and sometimes start lose track of reality. Lee’s performance here is totally for Amanda. He wants her out of the line of fire. As I said, he knows she can be tenacious, he just has yet to learn just how tenacious she can be. Why is Lee’s behaviour so harsh? Personally I’ve always felt he knows she can be like a dog with a bone when it comes to helping people and I see it as a necessary ploy to get her to back off. It fails but I never saw it as anything other than that. 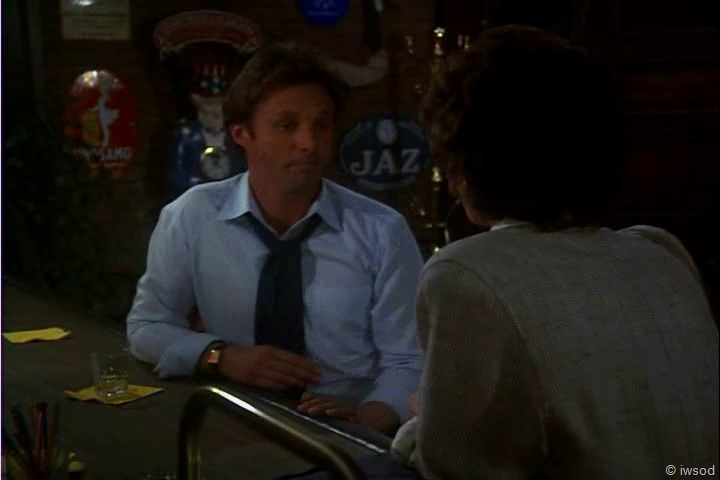 If he was to look like he was being friendly to Amanda at Neds that information could potentially get back to Jack and wreck any chance of catching the bad guys. A necessary evil if you like, especially if you know you’re being watched but unsure of exactly who is doing the watching. Go looking good? Goodness Amanda do you have your eyes closed?! He already looks good. Serious eye candy alert woo hoo! LOL Jenbo- I’ve used the phrase ‘necessary evil’ in an upcoming post! You’ve read my mind!! I agree that’s what is he doing – when I asked why does he do it- I was referring to why does he keep the fact that this is a cover from Amanda. Sorry if I was not clear there..
Can you tell I am not much of a cocktail girl LOL Unless it’s a Black Russian and then I’m your gal. Had no idea a Shirley Temple was non alcoholic waaaaaah! Why does Lee keep it a secret from Amanda? As much as his friendship with Amanda is blossoming he’s not the type of agent to risk blowing a mission by informing people who aren’t in “the know” what’s going on. He’s quite the stickler for the rules about that. I also think that Lee keeps it from Amanda because he has no idea what she is capable of. He knows she is quick to think on her feet, but he is about to find out what depths she does have inside of her. I was thinking yesterday about how different Lee is here as opposed to how he reaches out to Amanda in Wizard. I know we won’t go ahead. But sometimes thinking about the destination helps me to identify what the character is working on here at this point.